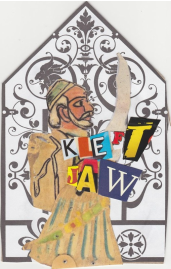 Much like the Greek Klefts exploited by the ancient Ottoman Empire, we at Kleft Jaw seek to transcend the current reality of modern poetry/prose. We simply cannot believe, will not believe, will not lie & say there are limitations to the human consciousness. There is a magna-force of possibility, teeming inside all of us, and that's why we exist- to invoke the transcendental realist spirit in contemporary writing- to establish a new aesthetic, to make words dangerous again. The Klefts spent their days fighting and robbing the wealthy Turks. Their nights were spent leaping around the fire, reciting poetry in celebration of the freedom they found in their hills away from the empire. Like the Klefts, we plan to fight for and celebrate our freedom. Send us your battle cries, your barbaric yawps, your rebel songs, and your love songs.